By the time of the dinner, Hungerford was also president of the Hungerford Securities Corporation, founder of the Hallenbeck-Hungerford Realty Corporation, and was involved with several other firms related to the copper industry. Hungerford was born into the copper business. One of 12 children of John and Charlotte Austin Hungerford, his father had built the first brass mill in Torrington, Connecticut in 1834. 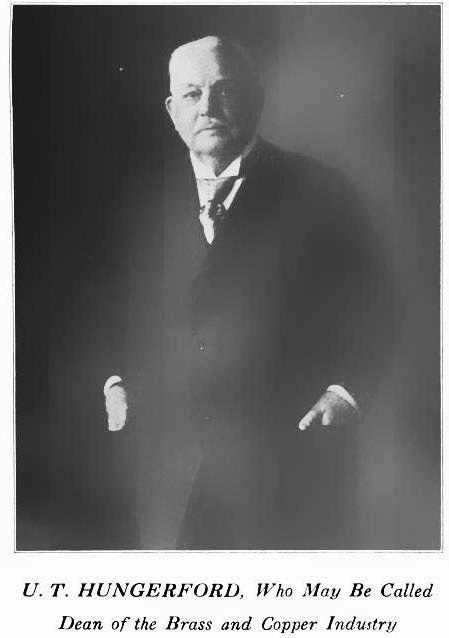 U. T. Hungerford arrived in New York in 1865 as the representative and manager of Wallace & Sons, a brass and copper rolling mills in Ansonia, Connecticut; then established the U. T. Hungerford Brass & Copper Co. in 1895. The firm’s success was unparalleled and by 1909. 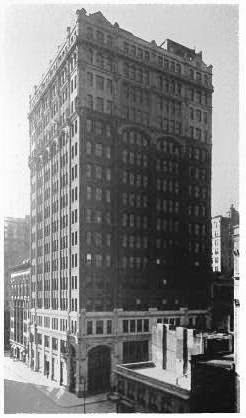 Its 10-story building at the southeast corner of Park and Pearl Streets bordered on the area condemned for the construction of the new Court House. The City tossed around the possibility of including the U. T. Hungerford building as part of an extended site. Frustrated, Hungerford and his partner in the real estate firm of Hallenbeck-Hungerford took matters in their own hands. They purchased land on the southwest corner of Lafayette and White Streets, extending through to Franklin Street, and began plans for a new structure. 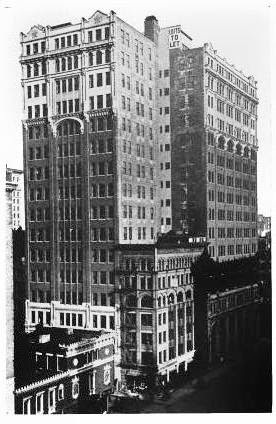 “Harry C. Hallenbeck stated last week that he has waited upon the city for about four years to formulate a decision as to what it intended doing, and had become so tired of the delay that he proposed to begin the reconstruction of the lower portion of the Park and Pearl Streets building,” reported The New York Times on July 20, 1913. The plans for the new building were well underway by the time of The Times article. In January that year The Bridgemen’s Magazine had announced that W. E. Austin had filed plans for a 17-story printing house with an estimated cost of $1.2 million—a jaw-dropping $27.5 million today. Austin had used granite for the three-story Gothic base. Cast metal spandrels, two-story arches and carved stone details carried on the Gothic motif. 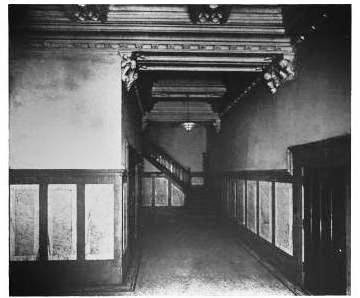 Above, nine stories of buff brick were barely ornamented; but were capped by three stories of exuberant terra cotta that picked up the Gothic theme. As intended, the building’s ability to support massive loads drew lithographers, printers and related firms. Among the first tenants was Craske-Felt Company, Inc., electrotypers. 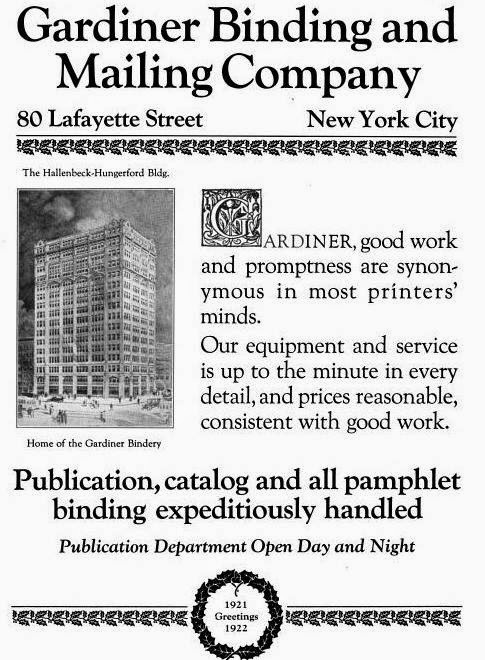 “Curved lead mould a specialty,” announced an advertisement in 1917. In January 1918 the United States Marine Corps took over the Ford Instrument Company when a strike got out of hand. The plant was manufacturing wartime articles necessary for national defense which were deemed “highly confidential.” When 250 men walked out because a foreman had fired a fellow employee, manufacturing could not cease. According to The Sun on January 12, Ford Instrument officials called the police for protection. “The dilemma was then referred to the Department of Justice, which in turn communicated with the Navy Department at Washington. What seemed like an efficient use of free, clean water turned out to be disastrous. Julia Healy was 24-years old in 1915. She and her sister, May, were both employed by Lupton Press in the building. In August that year the sisters and other girls employed in the firm began to notice a strange taste and color to the water. Julia and May Healy died within 14 hours of each other on September 13, 1915. A Board of Health inspector found colon bacilli in the water—the sisters had died of typhoid. At least a dozen other girls working in the Hallenbeck-Hungerford Building contracted the disease. On February 19, 1918 a jury ruled in favor of Dennis Healy, the girls’ father, in a lawsuit against Hallenbeck-Hungerford Realty. He was awarded $5,000 for Julia’s death. A similar suit for May’s death was still pending. 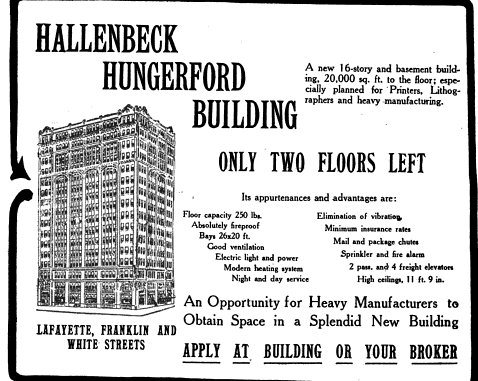 The year 1919 was one of intense labor disputes within the printing industry and tenants of the Hallenbeck-Hungerford Building had their hands full. On October 1 The Evening World reported “Further walkouts of compositors were features of the day’s developments in the labor disturbances in New York’s printing industry.” The workers demanded a 44-hour work week and $50 scale. 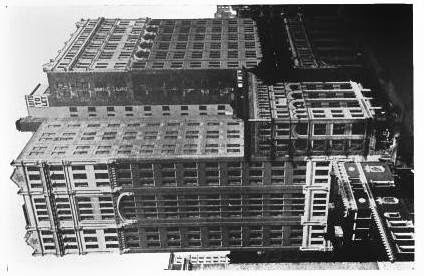 At some companies, workers walked out en masse; at others foremen were informed by workers one-by-one that they were “going on a vacation.” Among the printing firms struck that day was that of Isaac Goldman in the Hallenbeck-Hungerford Building. Four days later the compositors of Lipschitz Press walked out, to be followed on October 9 by the workers at Bradstreet’s “in a demand for shorter hours,” explained The Sun. The building continued to attract large printing firms. 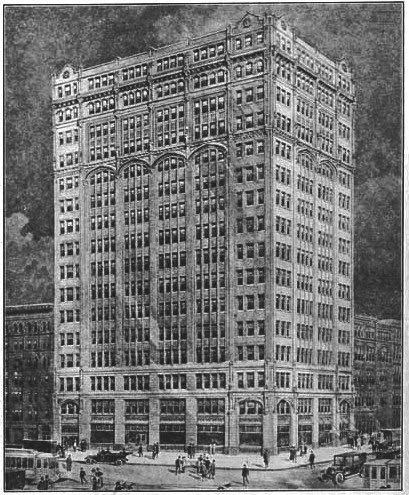 In August 1922 the Klim, Lindner & Bauer lithographer firm took the entire 15th floor, signing a 10-year lease at $200,000. The same year McClure Publishing, producers of McClure’s Magazine, was in the building. Around 1970 the tenant list changed from printers and publishers to governmental offices. The Department of Consumer Affairs, the Union Dental Center and the Child Welfare Administration all had their offices in the building until 1998. Then, in 1999, New York University converted the massive structure to Lafayette Hall, a residence building housing nearly 1,100 upperclass students. It was the scene of a bizarre accident in November 2013 when student Asher Vongtau, 19 years old, went missing for two days. He was found wedged at the bottom of a 2-foot wide shaft between the building and a parking garage. Somehow Vongtau had fallen off the roof and become stuck between the buildings where he was trapped for 36 hours before being discovered.